PHILADELPHIA — Peter Fader, a professor of marketing at the Wharton School of the University of Pennsylvania, has long yearned for the city life. For 20 years, though, he and his wife, Mina, have deferred that dream, living in a Philadelphia suburb to raise their two children in a 3,500-square-foot home. That will change this month, when the couple — with the children grown and gone — moves into a new luxury high-rise in the heart of Philadelphia. They will have expansive 11th-floor views, an easy walk to the shops, restaurants and cultural attractions of downtown and a car-free commute to work. The Faders are like many other empty-nesters in their 50s and 60s, as well as young professionals, helping fuel a boom in multifamily housing in the country’s big cities. The growth has been so strong, for so long, that some leading economists have started warning about overdevelopment, worried that flattening prices could leave builders struggling to pay their debts. The Federal Reserve in February expressed “growing concern” about commercial property, including large apartment buildings, in cities like New York, Boston and San Francisco. An index of national commercial property prices from Green Street Advisors, a real estate research company, has gained sharply since the recession although has largely stalled since late 2016. But developers do not appear to be pulling back, no matter the warnings, believing that there are many more people like the Faders. In a sign that the supply of housing will continue to swell in coming months, the number of building permits, a forward-looking indicator, rose 5.7 percent in April compared with a year earlier, the Census Bureau said. “It’s exploding,” said Ron Caplan, the president of PMC Property Group, a Philadelphia-based developer of rental properties in markets including Pittsburgh, Baltimore and Columbia, S.C., referring to the growth in demand for urban residential rentals. Mr. Caplan said that his company’s experience was at odds with the fears about overbuilding. In Baltimore, PMC just finished work on a downtown apartment building that has been leased at the quickest rate Mr. Caplan has seen since starting the company in 1981. He expects the property to be fully leased in six months, about twice as fast as is typical. In Columbia, the company is now leasing the Palmetto Compress, a former cotton warehouse, after creating 200 apartments for the local student population. With two months’ leasing to go before the start of the new school year, 90 percent of the building is leased, Mr. Caplan said. He attributed the surging demand to the increasing livability of downtown areas that were once rife with crime and poverty but that have become more appealing with the influx of new residents who are educated, professional and often wealthy. “What they have discovered is that it’s a lot more fun being social than it is going home at the end of the day, closing the door and watching television,” Mr. Caplan said. In Seattle, Lake Union Partners, a local developer, has built seven rental-apartment houses since 2012 for a total investment of about $200 million, with a vacancy rate of 4 percent, said Joe Ferguson, the company’s principal. Mr. Ferguson said that the market was being driven by vigorous hiring by major employers, including Amazon and Microsoft, and by employees’ increasing willingness to move to previously marginal areas like Pioneer Square, Seattle’s oldest neighborhood. The employers include Weyerhaeuser, a lumber company, which has responded to the influx of young adults by moving from a suburban location about 40 minutes south of downtown Seattle to a new building in Pioneer Square. In the Milwaukee area, some baby boomers are moving into the downtown area from the suburbs, encouraged by suburban housing prices that have finally recovered from the 2008-9 crash, said Barry Mandel, the president of Mandel Group, a developer of multifamily buildings. Some of the boomers are buying condos while others are opting to rent city properties and preserve the capital from the sale of their houses. Other older clients are driving the construction of urban enclaves, or “nodes,” within suburban developments, where suburban amenities like shops, restaurants and religious institutions are available within walking distance of people’s homes, Mr. Mandel said. The “nodes” are in strong demand from buyers in their 40s and older, Mr. Mandel said, noting that one such development was 100 percent leased before construction ended about 18 months ago, while demand in another community was unexpectedly strong. While suburbanites may welcome the opportunity to sell their lawn mowers or donate clothing to charity when moving to city apartments, there are limits to their zeal for downsizing, said Carl Dranoff, the developer of Philadelphia’s One Riverside building, where the Faders are moving. The 82 apartments originally planned for One Riverside, a 22-story building, have been reduced to 68, the result of combining some units for buyers who wanted more space after years in the suburbs, Mr. Dranoff said. 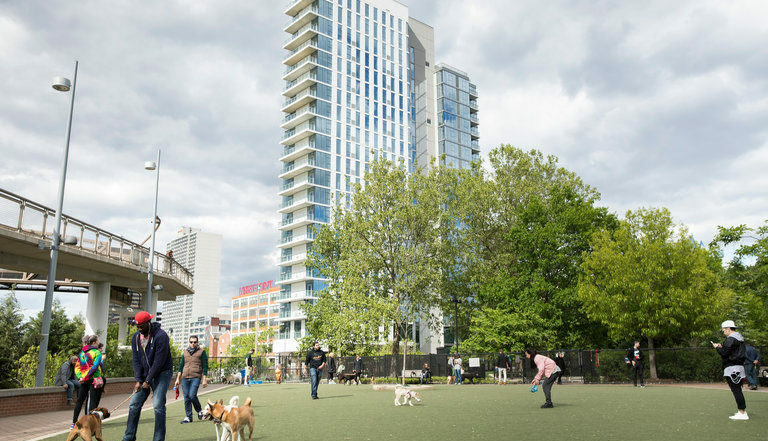 By the official opening on May 2, 80 percent of the building — the first newly constructed condo tower in central Philadelphia for seven years — had been sold. The building, offering marble counters, private balconies, and river views, sells 1,000- to 1,100-square-foot apartments for $1.5 million to $2 million, Mr. Dranoff said. A 2,500-square-foot unit costs from $2.5 million to $2.8 million. While such prices are beyond the reach of most buyers, they are contributing to a citywide erosion in affordability, and mirror the trend in other big cities, said Rick Sauer, the executive director of the Philadelphia Association of Community Development Corporations, which advocates affordable housing, among other causes. At One Riverside, the Faders recognized that the building met many of their long-term goals for city living and jumped at the chance to buy.